Spiritual Guidance: “Nana Buluku is the African Grandmother Creatrix, the supreme feminine creative principle. She created the Universe, then rested. The intersection of rest and extraordinary creative power is repeated in numerous spiritual traditions from varied cultures around the world. It is also repeated in the lives of inspirational innovators in varied fields of discipline from the sciences to the arts. When you are boldly ambitious and creatively confident for the fulfillment of your life purpose and heart inspired plans, it may seem that rest is the lat thing you have time for, there is so much to be accomplished. Yet the conscious use of deep rest allows us to connect closely to the divine creative genius. Taking time for renewing stillness can allow us to work smarter, rather than just always working harder. African spirituality is based on a holistic worldview where no issue in one’s life is separate from the spiritual worlds. This recognition that the Divine is intimately involved and lovingly invested in every single aspect of your life is how you begin to generate restful consciousness. This type of consciousness is based on trust that the Divine knows what you are here to do and wants to help you do it. Therefore, you don’t have to orchestrate the details of your life, nor figure out everything (or anything) on your own. You do not need to have signs to prove something is happening every single day. What you need is faith in the fundamental good will that the Divine has towards you and your life purpose, the reason for which you chose life in the first place. Healing Process: “Find a place to rest, lying down flat on your back, with your legs and arms slightly apart, preferably with soft lighting so that you can close your eyes. The aim is to create a restful environment that will feel supportive of your slowing down your thought processes and settling out of your head, into your body. 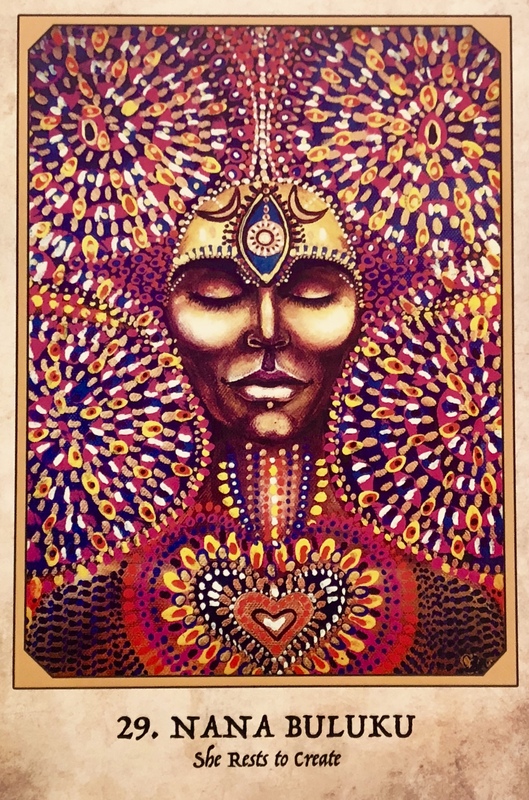 Gaze at the card image, noticing the soft circles that surround the head of the goddess. Allow your vision to soften and even become a little blurry as you slowly and gently shift your gaze from circle to circle. Do not focus sharply on anything, but just lightly and easily shift your gaze from left to right and right to left, up and down and down and up, from circle to circle. Do this slowly, until it feels lightly hypnotic and relaxing. You are going to imagine, visualize, feel or pretend that your thoughts can drift out of your head, moving around outside of your head, becoming like the soft round circles. The more the thoughts becomes soft, round and gently moving outside of your head, the more peaceful and restful the inside of your head feels. You can relax more deeply for healing and restoration. When you are ready, lay the card beside you and close your eyes. Rest for as long as feels good. When you are ready to awaken from your rest, ground yourself with some physical movement, as you bring yourself back into the now. Today is the new moon. What will you create? What seeds will you plant and what focused intention will you breathe into them? What emotions and feelings will nurture these dreams to life? It’s all up to you now and the new moon is a powerfully creative time to manifest your reality. Something new? Make it happen. Otherwise it will just be more of the same. And if more of the same is ok and you are in a good place, then use this opportunity to hone things, fine tune them so that you are spreading your joy and affecting others. This is a wonderful way to be of service. Much of your work today will be internal, so do not worry so much about the action. Take time to rest, relax and use that amazingly magical tool you were gifted with at birth… your imagination! Know that your inner resources are potent right now, and that you have everything you need in order to create more opportunity, possibility and love in your life.